Childhood obesity is prevalent in adolescents as well as children, which is considered as a major health risk for kids. A kid may suffer from childhood obesity if his weight exceeds the normal weight guidelines that are appropriate for his height and age bracket. The reason that childhood obesity is such a serious concern for kids is that childhood obesity makes them vulnerable to medical conditions like high cholesterol, diabetes and high blood pressure, which are not supposed to affect them until they become adults. In addition, obesity is also associated with depression and lack of confidence in kids, too. The lack of physical activity and exercise is another reason why children have been putting on so much weight. Nowadays, children spend much of their time in front of the TV or on their gaming consoles instead of taking part in exercise, which causes them to gain extra pounds. The activity programs in school have also not been able to make much impact on the BMI (Body Mass Index) of children. Lack of sleep is also one of the major causes for childhood obesity. Children that do not sleep properly have higher levels of ghrelin in their body, a hormone released by the stomach that induces hunger, causing them to eat more. Moreover, lack of sleep is associated with low levels of leptin, a hormone that is responsible for stopping the feeling of hunger. Having lower levels of leptin means that the child doesn’t know when to stop eating, and that further increases his weight. Geneticsfactor is considered responsible for obesity as well, which essentially means that obese parents are going to have obese children. People tend to think that child brought up in an environment where obesity is prevalent will turn up obese as well. Studies have revealed that the socio-economic environment in which the child is raised also has an impact on whether he develops childhood obesity. The researches done so far concede that the children of middle-class families are more likely to become obese because of their tendency to have snacks in between meals. Rare physical conditions like Cushing’s syndrome, growth hormone deficiency, Hypothyroidism, genetic syndrome, having a high birth weight, psychological or behavioral factors can also contribute to childhood obesity. Body Mass Index, also called BMI, is the standard used for assessing whether a child is obese or not. You will need a BMI calculator to evaluate your child’s BMI, which essentially gives an estimation of his fat with the values of his height and weight. After calculating your child’s BMI, you would have to plot it on a BMI chart and check if he lies above or below the 95th percentile. Children above this value are considered obese while those below 5th percentile are considered under-weight. BMI values are not considered for babies since they cannot accurately estimate their fat reserves. For them weight charts are used for determining whether they are overweight or not. Moreover, it is also important to note that BMI is not a perfect measurement of fat as well and can sometimes be proved to be quite misleading as well. However, BMI is still the best indicator for knowing if your child is obese or not. Emotional distress is also included in the consequences of childhood obesity. 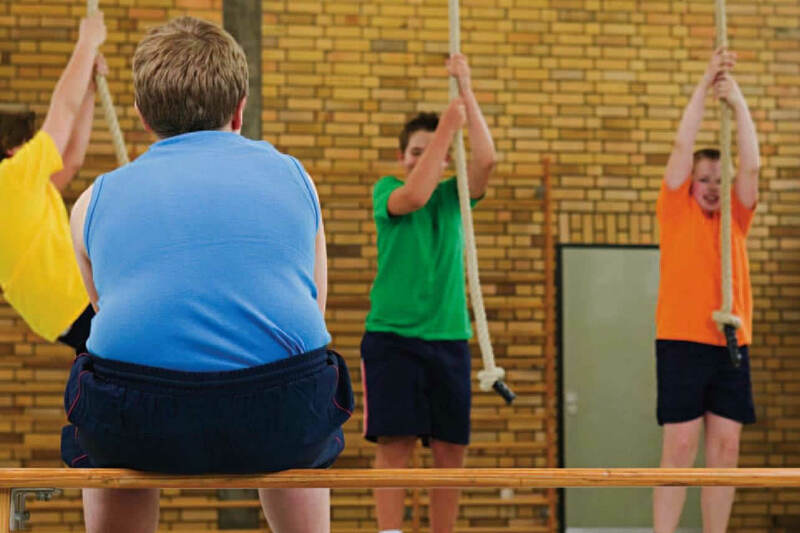 Obese teenagers suffer from anxiety, depression and obsessive compulsive disorder, since they are alienated by other children at school and have very low self-confidence. Try to give your child starchy-based foods and whole grain food varieties are optimal. Management or maintenance of weight is the right way to go for children who are only slight overweight and do not suffer from any other medical condition. This is a better treatment approach for obese children since it does not affect their height and helps them achieve a normal BMI. Obese children, on the other hand, might find it hard to handle both growing tall and losing weight simultaneously. Adding fruits and vegetables in the diet, avoiding or at least limiting the consumption of sweetened beverages, lessening eat outs and serving small portions of food at a time are some of the healthy dieting habits that can help your child in losing weight. Increasing your child’s activity level by encouraging him to spend less time in front of the TV and more time in doing physical activities like playing outdoor games and engaging in biking and running can go a long way in shedding those extra pounds. Orlistat (Xenical) is the only prescription medication that has been approved for weight loss in kids but it has risks associated with it, thus it is better to consult with your doctor before giving it to your child. Note that orlistat is only approved for children old than 12 years old. Surgery is also an option for weight loss for some obese children but it does not guarantee that the child will lose all his excess weight. Moreover, surgery is only recommended if all other methods of weight loss have been exhausted without any producing results. Or, your child’s weight becomes a bigger threat of his/her health than the possible risks of performing a surgery, then your doctor may suggest a surgery to your child. There are three ways that can be used for preventing childhood obesity. The first one is to adopt healthy eating habits at home, which helps your child get involved in eating healthy. Secondly, parents can motivate your child to take part in healthy physical activities like sports at school. Also, developing a healthy family lifestyle can stimulate your child to attend physical exercise. Lastly, limit your child’s time spent on the TV and gaming console.